visayīra — of materialistic persons; anna — food; khāile — if one eats; malina — contaminated; haya mana — the mind becomes; malina — contaminated; mana haile — when the mind becomes; nahe — is not; krera — of Lord Kra; smara — remembrance. "When one eats food offered by a materialistic man, one's mind becomes contaminated, and when the mind is contaminated, one is unable to think of Krshna properly. Śrīla Bhaktisiddhānta Sarasvatī Thākura suggests that people who are materialistically inclined and sahajiyās, or so-called Vaisnavas who take everything very casually, are both visayīs, or materialists. Eating food offered by them causes contamination, and as a result of such contamination, even a serious devotee becomes like a materialistic man. There are six kinds of association — giving charity, accepting charity, accepting food, offering food, talking confidentially and inquiring confidentially. One should very carefully avoid associating with both the sahajiyās, who are sometimes known as Vaisnavas, and the non-Vaisnavas, or avaisnavas. Their association changes the transcendental devotional service of Lord Krshna into sense gratification, and when sense gratification enters the mind of a devotee, he is contaminated. The materialistic person who aspires after sense gratification cannot properly think of Krshna. viṣayīra — offered by materialistic men; anna — food; haya — is; rājasa — in the mode of passion; nimantraṇa — invitation; dātā — the person who offers; bhoktā — the person who accepts such an offering; duńhāra — of both of them; malina — contaminated; haya mana — the mind becomes. Śrīla Bhaktivinoda Ṭhākura says that there are three varieties of invitations — those in the mode of goodness, those in passion and those in ignorance. An invitation accepted from a pure devotee is in the mode of goodness, an invitation accepted from a person who is pious but materially attached is in the mode of passion, and an invitation accepted from a person who is materially very sinful is in the mode of ignorance. SYNONYMSapavitra — polluted; anna — food; eka — one; thālite — plate; bhariyā — filling; prabhu-āge — in front of Lord Śrī Caitanya Mahāprabhu; nila — b ...rought; mahā-prasāda baliyā — calling it mahā-prasādam. .PURPORTThe word apavitra anna refers to food that is unacceptable for a Vaiṣṇava. In other words, a Vaiṣṇava cannot accept any food offered by an avaiṣṇava in the name of mahā-prasādam. This should be a principle for all Vaiṣṇavas. When asked, "What is the behavior of a Vaiṣṇava?" Śrī Caitanya Mahāprabhu replied, "A Vaiṣṇava must avoid the company of an avaiṣṇava [asat]." The word asat refers to an avaiṣṇava, that is, one who is not a Vaiṣṇava. Asat-sańga-tyāga, — ei vaiṣṇava-ācāra (Cc. Madhya 22.87). A Vaiṣṇava must be very strict in this respect and should not at all cooperate with an avaiṣṇava. If an avaiṣṇava offers food in the name of mahā-prasādam, it should not be accepted. Such food cannot be prasādam because an avaiṣṇava cannot offer anything to the Lord. Sometimes preachers in the Kṛṣṇa consciousness movement have to accept food in a home where the householder is an avaiṣṇava; however, if this food is offered to the Deity, it can be taken. Ordinary food cooked by an avaiṣṇava should not be accepted by a Vaiṣṇava. Even if an avaiṣṇava cooks food without fault, he cannot offer it to Lord Viṣṇu, and it cannot be accepted as mahā-prasādam. According to Lord Kṛṣṇa in the Bhagavad-gītā (9.26):patraḿ puṣpaḿ phalaḿ toyaḿ yo me bhaktyā prayacchatitad ahaḿ bhakty-upahṛtam aśnāmi prayatātmanah"If one offers Me with love and devotion a leaf, a flower, a fruit or water, I will accept it. "Krshna can accept anything offered by His devotee with devotion. An avaiṣnava may be a vegetarian and a very clean cook, but because he cannot offer Visnu the food he cooks, it cannot be accepted as mahā-prasādam. 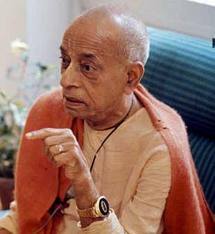 It is better that a Vaisnava abandon such food as untouchable.